by clicking on the Register link. By registering online, you are able to use the Express Check-In Lane at the registration table (just inside the gate from the parking lot behind the stores on Balboa Blvd.) by presenting the Voucher that will be emailed to you when you sign up online. Just for presenting the Voucher, the holder will receive an EP gift. After a quick verification, you’ll be on your way. While supplies last, each family will receive a token for one free Family Emergency Preparedness (EP) Starter kit. Everyone will receive one ticket each for the many drawings that will be held throughout the Fair (must be present to win). We are also hosting a Speaker Series in the Community Room, with an exciting lineup of four 30-minute talks from 10:30 am to 1:30 pm. 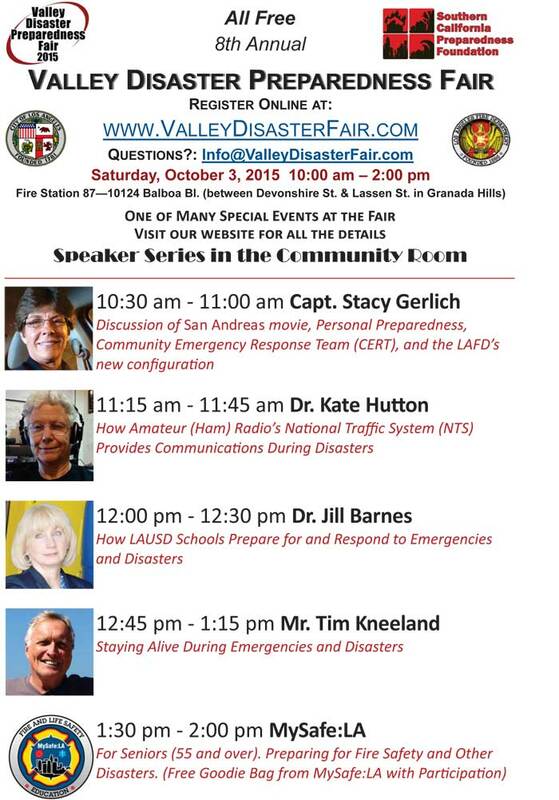 We have confirmed Dr. Kate Hutton (K6HTN), recently retired CalTech seismologist; LAFD Capt. and Paramedic Stacy Gerlich, Catastrophic Planning section of Homeland Security; Jill Barnes, Ed.D, CEM, LAUSD Office of Emergency Services, School Operations, and Mr. Tim Kneeland, wilderness survival expert and trainer, SurvivalEducators.com. is on Facebook and Twitter! Be sure to follow and like us to stay informed about the Southern California Preparedness Foundation’s efforts on the Fair, Map Your Neighborhood (MYN), Community Emergency Response Team (CERT), and more. 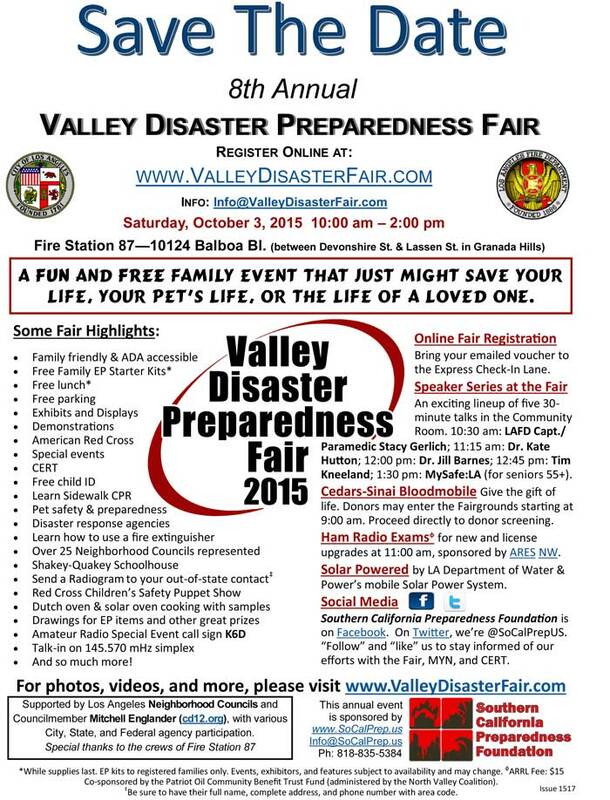 The latest Save The Date flyer may be downloaded from www.ValleyDisasterFair.com. Bus bench advertisements for the Fair will start appearing around August 1. Whoever sends the first email received at Info@ValleyDisasterFair.com (based on the email timestamp) with a photo of the ad and the location of the bench in the photo will receive a Mini Mystery Kit of EP supplies. Southern California Preparedness Foundation board members and their immediate families, and employees of Martin Outdoor Media, are excluded from participation.